It has only taken 10 days for 22 of the top 25 leading democratic nations listed in the Democracy Index 2011 to fall into abject diplomatic disarray. Their acute discomfort follows the rush by 17 of them to vote to admit Palestine as a non-observer state at the UN General Assembly on November 29 - whilst the other 5 abstained. Norway, Iceland, Denmark, Sweden, New Zealand, Australia, Switzerland, Finland, Netherlands, Luxembourg, Ireland, Austria, Germany, Malta, United Kingdom, Costa Rica, Japan, South Korea, Belgium, Mauritius and Spain - should have all joined the remaining three - Canada, United States and the Czech Republic - who cast a ” NO” vote. It mattered not to their democratic sensitivities that President Abbas was a lapsed President whose term of office had expired in January 2009 - a situation that would never be tolerated in their countries. It mattered even less that Abbas was purporting to speak on behalf of a territorial entity he did not control - even as a tyrannical despot. It was of no consequence that Abbas claimed to represent a population that was hopelessly split in its allegiances between the PLO and its arch rival Hamas. It was irrelevant that no elections had been held for the last six years to give the people any say on which one of these protagonists - or anyone else who might want to throw his hat into the ring - should represent them. Their votes were cast in the full knowledge that they were adding their voices to those who saw nothing dishonourable in jettisoning the Oslo Accords and the Bush Roadmap to the political scrap heap by endorsing the PLO’s unilateral approach to the United Nations in breach of those internationally negotiated agreements. 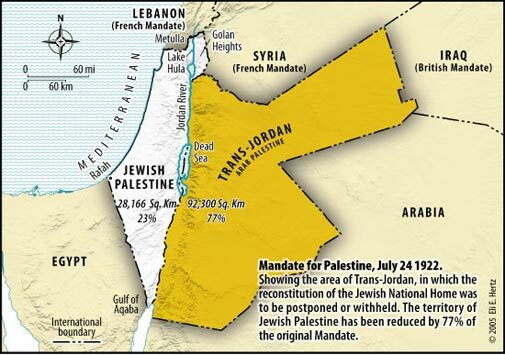 These democracies were happy to undermine any need for further negotiations to determine the future sovereignty of the territory in dispute between Israel and the Palestinian Authority - effectively limiting any negotiations to when and on what terms 600000 Jews would leave their homes in which they had lived for the last 40 years. Indignation and shock horror greeted the news that Israel should have the temerity - just three days after their vote - to announce its intention to revive its stalled plans to build 3000 housing units in part of the disputed territory bearing the amorphous title E1 - which these democracies had just determined should be vested in the Palestinian Authority. This was the catalyst for all diplomatic hell to burst forth. These democracies did what all good democracies do to show their displeasure at those who treat their decisions with contempt. Britain, Spain, Sweden and Denmark called in Israel’s Ambassadors and gave them a diplomatic dressing down. The British Foreign Office issued a statement that the E1 project was a serious violation that threatened the two-state solution. Speaking from Papua New Guinea, Australia’s Foreign Minister Senator Carr said the Australian Government had made clear its call to all sides not to exploit or overreact to the vote and called in Israel’s Ambassador to deliver the message. Senator Carr had reportedly railroaded the wishes of Australia’s Prime Minister who had wanted to cast a “No” vote - forcing its replacement with an abstention after threatening the Cabinet might demand a “Yes” vote if his recommendation was not accepted. “I am extremely disappointed with these reported Israeli decisions. Good faith? Surely the prospect of any such negotiations had already gone out the window when most of the world’s 104 democracies had voted as they did. Three days later these democracies received their come uppance when Hamas leader Khaled Meshaal made a triumphant first visit to Gaza. The centrepiece of the rally was a huge replica of a type of rocket terrorists from Gaza fired indiscriminately into Israel’s civilian population reaching as far as Jerusalem and Tel Aviv just a few weeks before the General Assembly vote. Have any Palestinian diplomats been called into any foreign capitals and given a dressing down? There are plenty of them working in democratic states representing this Mickey Mouse United Nations “state”. Has there been any revulsion expressed at the statements made during this rally or any indication that the the flow of billions of dollars into Gaza to assist its baying-for -blood population will cease? Has Mahmoud Abbas been asked to express his disgust at the rejection by Meshall of the two-state solution laid out by Abbas at the General Assembly just 8 days earlier? These 22 democracies and the other democracies who joined them in voting as they did have done untold harm to resolving the Jewish-Arab conflict. Their subsequent inability to take concerted action following Meshaal’s visit to Gaza is appalling. And that is just 10 days into the life of this infamous Resolution. Foreign Minister Carr and the other 21 Foreign Ministers - where are you hiding, when will you wake up and wipe the egg off your collective faces?